Solar telescope is up and running! Click the image to see Mark Hellweg's Flickr page. 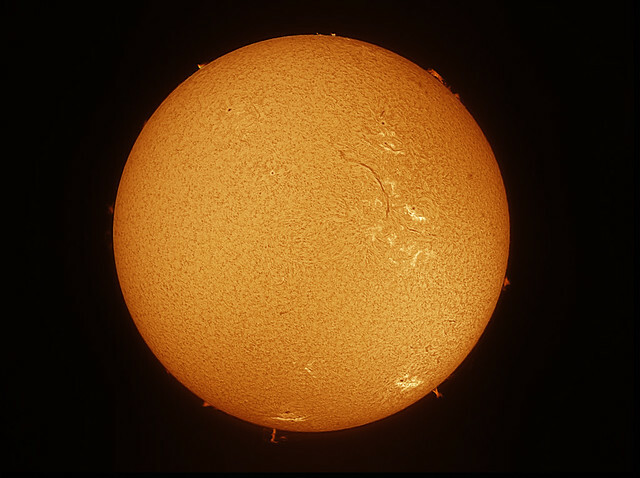 Note the string-like filaments and prominences along the limb of the Sun's globe, the granulation of the surface, and what appear to be "cracks" (magnetic disturbances). Click the image to see this astro-blog. A feature of this telescope that I thought was just a marketing ploy turns out to be amazing: It's "tunable," in that you can turn a little dial between the front H-a filter and the second H-a filter, and this shifts the spectrum of light passing through to the eyepiece a little toward the red end or a little toward the blue end of the H-a band of light. What this does is alter what's most visible, much the way other Doppler effects work: Toward the blue (I know, it's ALL red, but the less-red end of the light-frequency) end, features moving toward the Earth are more visible; toward the far-red, features moving away from the Earth are more visible. I found that most prominences suddenly LEAPED INTO VIEW about 1/2 to 3/4 of the way tuned, suggesting that most of today's liveliness is taking place on the very edge or slightly toward us. Makes sense, considering we can't see the other side of the Sun's globe... and if we could, it would be the same deal over there, of course! Click the image to see the big image. As I was watching the Sun, my neighbor Bret stopped by his house while running errands, saw me, and strolled over for a view. Even he was able to see these details - surprising, because getting a good look through a telescope pointed at the Sun requires practice. You need to leave open both eyes while covering the one you're not using and shading the other... and focusing at the same time with your third hand. And keeping the Sun centered in the eyepiece by turning the mount's slow-motion equatorial control with your fourth hand. Wonderful to be able to share my first time! Okay, now I'm back to work. Finals are pouring in, y'know. So glad you were able to use it! And you had company! 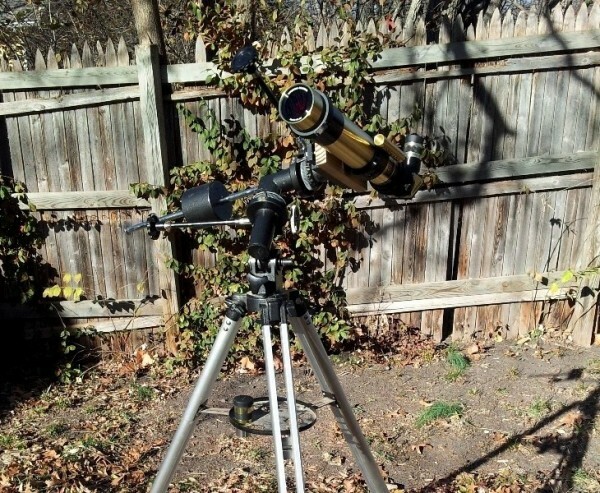 This makes me want a solar telescope. Getting the chance to watch the Venus transit last spring through one made me start hunting down one of my own, that's for sure. My white-light filter over my much larger Meade telescope gave a MUCH less interesting view than through this little wonder.